Home / Tower Fan Advice / How Do Tower Fans Work? E lectric fans are fast becoming the de-facto ‘supplementary’ cooling solution in homes because cranking the air con up all day isn’t practical anymore. (And the weather shows no respite either)! That may sound surprising given that the humble fan has always been maligned and termed an eyesore. Especially because your options are no longer limited to conventional ceiling fans or arcane pedestal fans. Tower fans are here. They are lookers, they are portable, can wiggle into the tiniest nooks and crannies of your room (need less space) and most importantly, offer superior airflow quality. With features like the HEPA filter and an ionizer, people are often left wondering, ‘how do tower fans work’? Here’s the lowdown on it. Let’s start with the design first. Tower fans have a slender box styled design with vents that almost run the length of the casing. This, clubbed with the oscillation gives it a much wider airflow path as compared to any other type of electric fan. They are available in a variety of finishes from wooden to metallic to straight out of Star Trek. Some of these have a stationary base. But it is not uncommon to find models with a rotary wheel base for portability. Most tower fans have variable speed settings, a programmable timer that allows you to switch on or off automatically, a remote control, an ionizer for odor control and a couple of filters that clean the air before releasing it into the room. Air is sucked into the unit through tiny inlet vents that are normally positioned on the base or the side casing of the fan. These vents have a pre-filter attachment that filters out large-sized dust, dander and particulate matter. This filtered air is then pushed at high speed through a cylindrical tube that holds the impeller blades. The impeller blades push the air in a vertical direction (up and down) through an air guide that then, releases it at a 90-degree angle through a HEPA filter into the room. There are two notable differences in the working from that of a conventional ceiling fan. The 90-degree angled release of the air. The oscillation which creates an arc that naturally covers a wider space. This simple, yet effective mechanism makes the tower fan a much better choice than conventional fans for cooling large sized rooms. How quiet are tower fans? 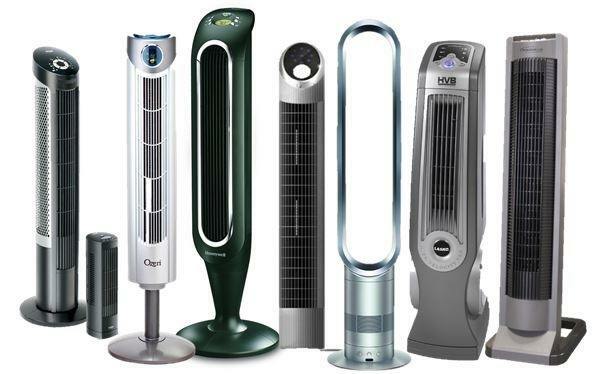 Because of the different blade style, tower fans are believed to be noisier than window fans or ceiling fans. While the force of the air being pushed through the cylindrical chamber does create a slight whirring sound, it can be compared to the white noise created by any other fan. At the highest speed setting, maybe there’s a little extra noise. But it’s not noticeable enough to be an annoyance. Tower fans may be prone to overheating though. So put that timer to good use and let the motor cool off after a few hours of operation.